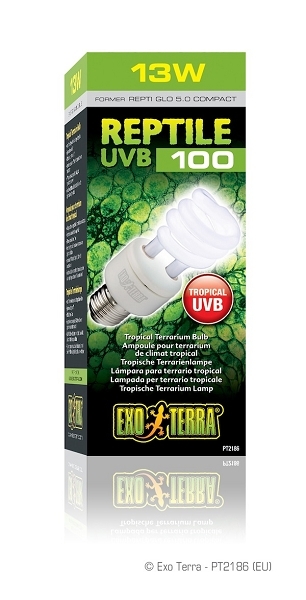 The Exo Terra Reptile UVB100 emits optimal levels of UVB, similar to that of shady environments such as rain forests or other tropical locations. Reptiles living in these habitats receive moderate UV radiation due to climatological conditions (fairly high humidity, changes in weather, etc) that prevent unfiltered sunlight from reaching the reptile s basking site. The optimal Vitamin D3 yield index ensures vitamin D3 photosynthesis to aid calcium absorption and prevent metabolic diseases.